We are pleased to announce our brand new super fast WordPress plugin Crunchy Sharing. That’s a main reason, we have been working on creating super simple Social Sharing WordPress plugin and it’s ready for prime time now. 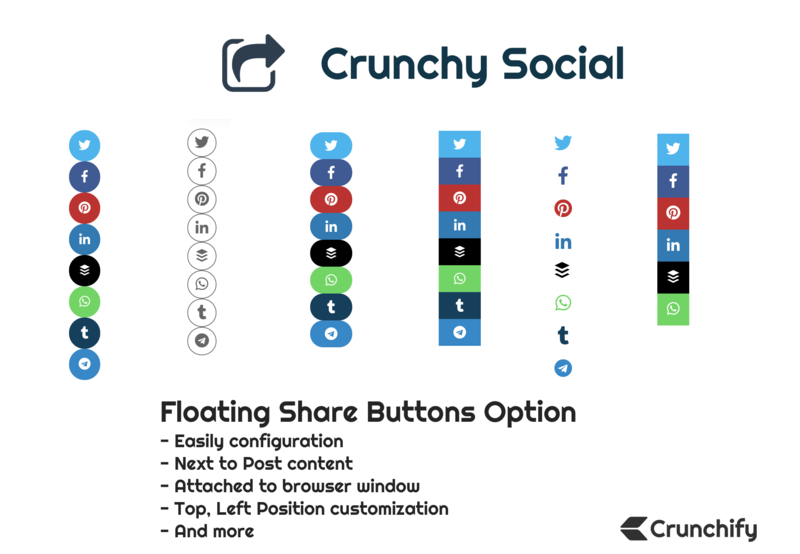 Main idea behind Crunchy Sharing plugin is to keep simplicity in mind. We are using Crunchy Sharing on all of our client sites and on Crunchify too. No messing around with code or your functions.php file. Performance optimizations shouldn’t have to be complicated and so everything can be configured with a single click. Crunchy Sharing is created with performance in mind. Without making any query to Database, External API endpoint, Crunchy Sharing button loads in fraction of seconds. Here are some of the current features in the Crunchy Sharing WordPress Plugin. And there are a lot more coming too! You get support directly from myself and our Crunchify Team. We don’t outsource anything. And yes, the plugin comes with a 14-day money back guarantee. We hope you enjoy the Crunchy Sharing plugin as much as we do! We have a lot of great new features already planned for it and hope to make it the #1 lightweight social sharing plugin for WordPress. How to add FontAwesome.io Fonts to WordPress without any Plugin?